Collaboration is critical to the success of competitive intelligence (CI) functions. Organizations that gather and interpret market or competitor data must be able to convert it to actionable intelligence that clients can use. To do this, teams must share information and insights – that is, they must collaborate effectively. While even the best employees and teams may occasionally miss the mark when it comes to sharing information, some companies have a more pronounced resistance to collaboration. But whether it’s intentional or unintentional, occasional or pervasive, failing to share data and insights can inflict considerable harm on the CI department or the organization as a whole. With the myriad of electronic communication platforms available today, why is collaboration still a problem? What can be done to enhance the sharing of information? Before we get to the top three ways to improve collaboration, let’s first look at three things that impede the flow of information between teams and individuals: insular culture, bad attitudes, and lack of time. In many companies, especially large corporations, departments tend to have an inward focus. Staff may engage in territorial behavior to protect the group and its resources. Even seemingly unrelated factors, such as compensation structures, can impact collaboration. For example, when an executive’s pay is tied to department results, myopic thinking and a lack of information sharing can result. In many cases, employees are simply too busy to collaborate and have too many competing priorities. In the corporate world, we are often asked to “do more with less” – to take on more projects and responsibilities for the good of the company. Developing a strategic plan for collaboration takes a back seat to the constant stream of reactive tasks. Everything is urgent! Our most important priorities, however, should not be reactive. Solid competitive intelligence is critical to a company’s growth and overall success. An open flow of information between teams and individuals helps us reach valid conclusions, make more confident recommendations, and produce more comprehensive reports. As such, a company’s approach to the CI function — and to information sharing throughout the organization — warrants a thoughtful plan. So, how do we improve collaboration? Successful firms develop an explicit strategy and make organizational changes to aid performance in these efforts (MacCormack 2007). The three tips below are excellent ways to begin a collaboration strategy and promote the sharing of information. Collaboration starts at the top. It’s critical that leaders help employees understand the link between information sharing and better competitive intelligence. 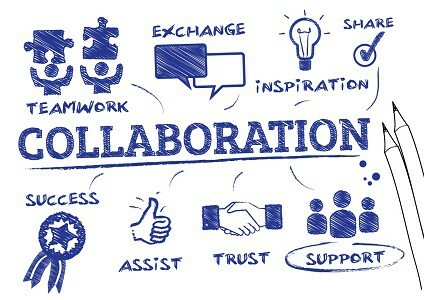 Leaders should emphasize that collaboration is vital, and support the sharing of resources across functions. To highlight cross-team successes, leaders should model the practice of giving other team members credit whenever possible. Make it a standard practice to give and receive feedback on the information that is shared. Showing appreciation for others’ time and efforts encourages a positive cycle of collaboration. By sharing information freely, companies can institutionalize knowledge and reduce the reliance on one or a few “indispensable” individuals. To further reinforce a culture of collaboration, consider forming a CI community that provides professional support from a network of experts. If you aren’t already using technology to enhance collaboration, it’s time to start. If you already use it, make sure you are doing it in the most intelligent way possible for your business. Several platforms accelerate and enhance the sharing of information, including corporate social media platforms (e.g., Yammer, Jive, Slack, Chatter), video chat (e.g., Skype, Google Hangouts), wiki pages, cloud-based documents and spreadsheets, and online portals for teams or projects. Collaboration is a critical competitive advantage. It’s imperative that companies honestly assess the collaboration between their CI function and other departments. Success requires a strategic approach to information sharing — not just between a few teams or a handful of individuals, but across the entire company. Gates III, William H. (1999). Business @ the Speed of Thought: Using a Digital Nervous System. New York: Warner Books Inc.
MacCormack, Alan; Forbath, Theodore; Brooks, Peter; Kalaher, Patrick (2007). Innovation Through Global Collaboration: A New Source of Competitive Advantage. Harvard Business School Working Paper 07-079.